Botanical name: Acampe joiceyana (J.J.Sm.) Seidenf. with original publication details: Nord. J. Bot. 22: 532 2002 publ. 2003. Synonyms: Acampe thailandica Seidenf. 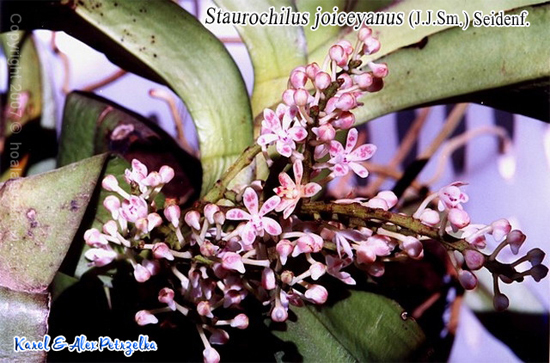 ; Staurochilus joiceyanus (J.J.Sm.) Seidenf. 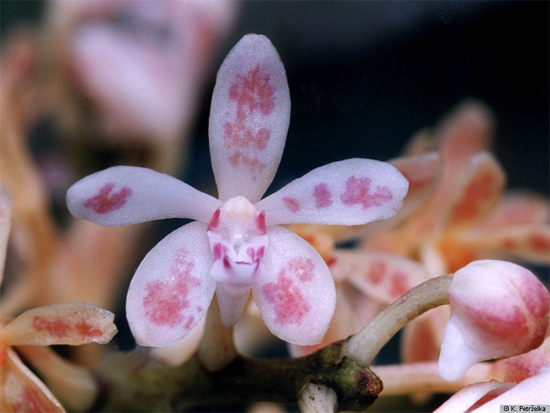 ; Trichoglottis joiceyana J.J.Sm. Botanical name: Acampe ochracea (Lindl.) Hochr. with original publication details: Bull. New York Bot. Gard. 6: 270 1910. Botanical name: Acampe papillosa (Lindl.) Lindl. with original publication details: Fol. Orchid. 4: 2 1853. Vietnamese names: A cam sóng (PHH), Bắp ngô cụm ngắn (TH). + Epiphytic on tree trunks in forests; ca. 500 m. Hainan, SW Yunnan [Bangladesh, Bhutan, NE India, Laos, Myanmar, Nepal, Thailand]. Botanical name: Acampe rigida (Buch.-Ham. ex Sm.) P.F.Hunt with original publication details: Kew Bull. 24: 98 1970. Vietnamese names: A Cam cứng (PHH), Bắp ngô ráp (TH). Distribution: Epiphytic on tree trunks or lithophytic on rocks in forests; 300-1800 m. S Guangdong, SW Guangxi, S Guizhou, Hainan, Taiwan, E, SE, and SW Yunnan [Bhutan, Cambodia, NE India, Laos, Malaysia, Myanmar, Nepal, Sri Lanka, Thailand, Vietnam; Africa].